Good News Everyone (ala Futurama *snicker*), the 1/72 VF-25G Messiah build is almost finished. I'd say about 80% done already. With only the minute shoulder parts, the sniper rifle, hands and decals left to build. Oh yeah, and the coloring of the cockpit and pilot figure. Though I probably won't do that anymore since I don't have a source for black paint because Japan's postal service decided to go strict and because I'm planning to just keep it in Battroid mode once I display it. I sure can't wait to transform this kit to Battloid mode. 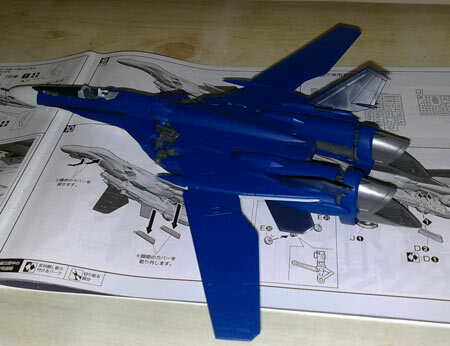 I'd probably take time off before decaling so that I can continue with translating the VF-25G's manual to English.